Packed with antioxidant polyphenols to destroy harmful free radicals and boost your body’s resistance to infection, black tea also has about half the caffeine of fresh coffee. The bergamot oil with which Earl Grey is flavored comes from a type of orange that is thought to help digestion because it stimulates production of stomach enzymes, helping to break down food. Because green tea is rolled and dried rather than fermented, like black tea is, it retains more nutrients and has a higher antioxidant immune-boosting, anti-aging effect. Research has found that green tea can help prevent a whole range of diseases, including diabetes and cancer of the stomach, prostate, and lungs. It can also help reduce cholesterol levels and appears to give more effective protection against Alzheimer’s than black tea. Pu-erh tea is thought to help lower cholesterol, blood sugar, clear the mind, and aid digestion. 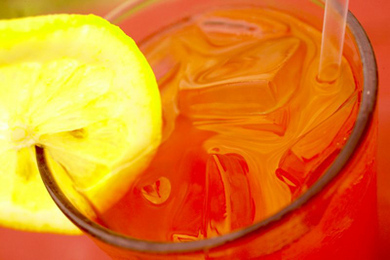 Made from a South African tea bush, redbush, or rooibos, is one of the healthiest teas around. It is the only naturally caffeine-free black tea. It is richer in antioxidants than black tea, can help promote healthy skin and ease eczema, and can help prevent diseases including cancer. It has also been used to calm the symptoms of irritable bowel syndrome and reduce muscle cramps, and it has anti-inflammatory properties. Whereas black tea is made from tea leaves, white tea is made from only the buds of the tea bush. This gives it even greater health benefits than green tea. It tastes like a slightly milder version of black tea and can be drunk with or without milk. Herbal teas have a wide range of health benefits. Mint tea, for example, stimulates production of digestive juices and can ease the discomfort of irritable bowel syndrome and aid digestion. Clean-tasting chamomile tea can help soothe the nerves and relax the muscles, so is a good nighttime drink. Elderflower tea is said to help alleviate symptoms of allergies and is often recommended to people with hay fever. Herbal teas are caffeine free. Peppermint tea aids digestion; studies have shown that it has an antispasmodic effect on the digestive system. Ginger tea beats nausea, and raspberry leaf tea is great for late pregnancy and menstrual irregularity. Adapted from Tea Bliss by Theresa Cheung (Conari Press, 2007). Copyright (c) 2007 by Theresa Cheung. Reprinted by permission of Conari Press. Adapted from Tea Bliss by Theresa Cheung (Conari Press, 2007).